I'm seriously starting to rethink my rule about not covering EPs. And really, it's not even so much a rule but a guideline I gave myself to avoid getting swamped by the neverending stream of artists looking to show off their newest bundle of songs, and it's one I've been willing to break at least a couple times a year. At this point, it's borderline arbitrary, one minor stopgap to prevent my schedule from becoming overloaded. But believe it or not, I did actually have a reason why I didn't cover EPs: I liked covering albums with thematic arcs and concepts and the drive to put together a self-contained idea, and my general thinking is that you couldn't usually pull that off on an EP with two to three songs. But in a era where I've seen EPs longer than some albums - hell, Isaiah Rashad's Cilvia Demo was nearly fifty minutes - or loaded with eight or nine songs, the more you get the impression artists are calling them EPs as a stopgap, something to hold time before official releases where they can push out their extras while using that as a gentle excuse to not judge them as harshly. And in a sense that's fine, that's why most EPs were released, fragments and teasers for fans who were craving more between records - and yet in the digital era where we're no longer bound by physical space on a disc, EPs have been getting longer and longer. So I'm left with a quandary: continue to ignore EPs except when I really, really want to highlight a neat song, or break the rule altogether to dig into Carly Rae Jepsen's E.MO.TION: Side B, a project that doesn't even attempt to hide that it's full of extras from that pretty damn good synthpop album from last year. And yet given how many critics were saying it was even better than E.MO.TION... well, I was curious. At the very least Carly Rae Jepsen's got some serious competition thanks to Shura's excellent debut Nothing's Real that dropped a few months back, and given that it is a pop record, Carly Rae Jepsen probably isn't going to be bothering with a core theme or idea anyway. So whatever, I was curious and I was looking for some good synthpop, so did with E.MO.TION: Side B did I get it? Well, yeah, it's pretty good... but again, if I hadn't gotten the swarm of requests for this release, I probably would have skipped over this EP and gone straight to Isaiah Rashad and De La Soul. Basically, if you liked E.MO.TION, here's more of it: a gleaming tribute to late 80s synthpop and R&B that's pretty damn catchy and well-executed enough to slip right into the joy receptors of your brain. It doesn't hit the highs of the first E.MO.TION, but the tighter construction also means it avoids the lows and probably adds up to a more cohesive project as a whole. In other words, while it is indeed good, I'm not sure it's got that additional weight across the board to make it, say, as strong as Shura's Nothing's Real. Now some of you are probably already a bit annoyed I've referenced that record twice already - but if you've heard them both, you really can't ignore the comparison. Carly Rae Jepsen has more energy and colour than Shura, but arguably less personality and character in lyrics and vocals. The broad strokes are that she's a girl riding the waves of relationships, with songs more driven by emotional logic than any sort of thinking - hell, on 'Body Language' she flat out says they might be overthinking things. And sure, it's not precisely a mature approach, but there is something to capturing that whirlwind of conflicting emotion on these tracks, from the reunion with an old flame on 'First Time' to her own hesitation 'The One', where it's a comfortable situation and yet she doesn't want to face the pressure of being 'the one', even as her own feelings are starting to creep in. 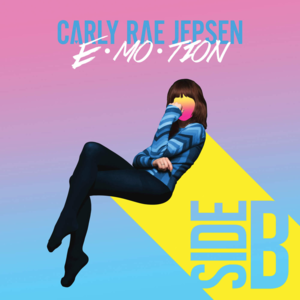 What's telling about E.MO.TION: Side B is its sense of emotional honesty: the breakup tracks like 'Fever' and 'Roses' are pretty blunt about lingering residual feelings, and album standout 'Cry' shows her own frustration that her partner won't open up in the same way. Granted, when you follow it with 'Store', a song where she's trying to leave her partner and play it as light and gentle as possible strikes me as a tad too cutesy, pushing for openness and yet not always being honest with herself. And while I do think she knows it, you also get the lingering impression she's almost letting herself off the hook, which can be a bit exasperating. Granted, that's if you run with the impression that Carly Rae Jepsen is playing the same 'character' across this record, and I'm not quite sure she is. A lot of this has to do with the vocal production, which alternates between being sparse and isolating her in the mix like on 'Roses' or the heavier multi-tracking that you see on 'Cry' or 'Body Language' or 'Higher', or the more outright synthetic vocal production on 'The One'. And that's not counting the fact that Carly Rae Jepsen brings her versatility even further to the forefront, alternating between coos and belting across her entire range depending what's needed for the song... and yet there's a small part of me that feels like that chameleon instinct might not serve her for a full project. Granted, it was more evident on E.MO.TION and on some level expected for a pop act, but it plays to an identity that doesn't quite feel as solid as I'd like, not helped by writing that tends to avoid a lot of greater detail to flesh things out. Again, it's pop, I get a desire for universality, but there's a part of me that wants to see more colour to Carly Rae's character, it's interesting! Granted, it helps that the production plays up that personality, all bass-touched new wave grooves with layers of glossy synthesizers, tight rhythms, and hints of guitar to add a hint of bite. And while you don't get any wonderful melodic moments like the horn that opens 'Run Away With Me', the only place where the Stock, Aitken & Waterman-esque overloading of the mix comes through is on 'Higher' - interestingly the one song that Carly Rae Jespen didn't write - and even then it's only on the hook, especially considering how strong that low groove can feel. Hell, if you're looking for one instrumental element that characterizes this record, it's that low synth and bass groove - from 'The One' to 'Cry' to the subtler foundation on 'Roses' or the trembling double-tap of the beat on 'Store' or the flat buzzy waves of synths playing off the heavy beat on 'Body Language'. That said, this album does have a few instrumental moments I did really dig: the heavy multi-tracking against the subtle guitar touches on 'Cry', and especially those heavier synth notes that drive the pre-chorus and hooks on 'Fever', perfect way to really connect for me. I will say that I do wish some of these beats and melodies got a little more room to breathe - for as good as they are, this record could have really shone if the midrange was opened up a little more to match that thicker synth foundation, or added a bit more gloss or sparkle. But really, that's nitpicking on an otherwise fine pop EP, which for me is roughly on par with the album. Granted, in a year where Shura dropped a similar record with more subtlety, sharper writing, better hooks, and gorgeous production, E.MO.TION: Side B can feel a little slight at points... but it's pop music, it's allowed to be. So for me, I'm thinking a 7/10 and a recommendation, especially if you liked E.MO.TION, because almost for certain you'll like this. Otherwise, if you're somehow still on the fence with Carly Rae Jepsen... well, she's the Canadian equivalent to Robyn, and if that doesn't win you over, nothing will.